Is the Elusive 'Planet Nine' Actually a Massive Ring of Debris in the Outer Solar System? Artist’s depiction of small objects within the Kuiper belt. The odd orbital arrangements of objects beyond Neptune have led scientists to speculate about the existence of a so-called Planet Nine—a hypothetical large planet in the outer reaches of the Solar System. New research suggests a planet isn’t required to achieve the anomalous orbits, and that a massive ring of debris is a more plausible explanation. Critics of the proposed disk say more evidence is needed. The elusive Planet Nine, sometimes referred to as Planet X, is thought to exist owing to the peculiar orbits of certain Kuiper Belt Objects, also known as Trans-Neptunian Objects (TNOs). Astronomers have documented around 30 anomalous TNOs to date—objects featuring exaggerated and inclined orbits, and odd clustering behavior. To explain this, astronomers have proposed the presence of a yet-to-be discovered planet. To work, Planet Nine would have to located around 200 Astronomical Units (AU), or around 18.6 billion miles, from the Sun, and have 10 times as much mass as Earth. The gravitational influence of this hypothetical planet is “shepherding,” or gradually shoving, TNOs into their observed orbits, according to this theory. Artist’s depiction of Planet Nine. New research published this week in the Astronomical Journal is offering a fascinating alternative to the Planet Nine hypothesis. Rather than invoking a mystery planet to explain the odd orbits of certain Kuiper Belt objects, the authors of the new study, Antranik Sefilian from the University of Cambridge and Jihad Touma from the American University of Beirut, argue that an outer Solar System disk comprised of rock and ice could produce the same effect as a large outer planet. Sefilian and Touma provided no observational evidence for this alleged disk, simply because none exists. Instead, the authors presented a new mathematical model demonstrating the theoretical possibility of this proposed structure. Importantly, the new model doesn’t completely rule out the existence of Planet Nine, or at least a smaller version of it, as the combined gravitational influence of an outer planet and an outer debris disk could likewise produce the observed TNO orbits. Sefilian and Touma are not the first to propose this theory. In 2016, a study led by astronomer Anne-Marie Madigan from the University of California, Berkeley, suggested an outer Kuiper Belt disk comprised of ice-covered planetesimals—the bits and pieces left over from the formation of the Solar System—could be responsible for the strange TNO orbits. The new paper is different in that a mathematical model was used to show how this hypothetical disk, and the Solar System’s eight planets, might influence the orbital configuration of TNOs. If this outer band of planetesimals exists, however, it would defy conventional predictions about the number and total mass of objects beyond Neptune. Current theories suggest the total mass out there is around one-tenth the mass of Earth, according to the study authors, but for this to work as they described, it would have to be around 10 times the mass of Earth. It’s thus a big claim, one requiring further proof. Proving the existence of this debris disk, like proving the existence of Planet Nine, is not as simple as searching into the distance with our telescopes, said astronomer Carlos de la Fuente Marcos from Complutense University of Madrid. We also spoke to Caltech astronomer Konstantin Batygin, who, along with his colleague Mike Brown, published evidence for the existence of Planet Nine back in 2016. The mathematics in the new study are “first rate,” Batygin said, but he pointed to several astrophysical shortcomings. For one, the Kuiper belt is assumed to end at around 48 AU, or 4.5 billion miles, from the Sun—the so-called “Kuiper cliff,” beyond which TNOs are negligible. Second, Batygin pointed to recent research suggesting the Kuiper belt has a cumulative mass closer to 50 times less than that of the Earth, which is far less than the conventional one-tenth-Earth estimate, and certainly far less than the 10-times-Earth estimate. These two data points, when taken together, mean the massive disk proposed by Sefilian and Touma “must start at hundreds of AU” from the Sun based on what is known observationally and from celestial mechanics, which isn’t plausible, Batgyin said. He also found it hard to believe that a massive protoplanetary disk could reside at distances beyond 100 AU, as the new study suggests. All these questions, and others, “remain unaddressed by the study,” said Batygin. Ultimately, the new paper “falls short of being an astrophysically plausible explanation for the anomalous structure of the distant solar system,” he said. No question, the primary weakness of the paper is the absence of astronomical evidence—but the same claim can be made about arguments in favor of Planet Nine. 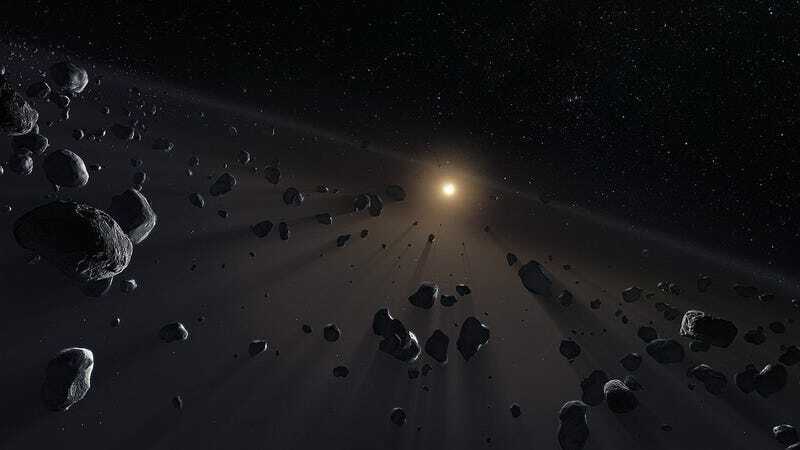 It’s quite possible, as some research has argued, that no orbital anomalies exist in the Kuiper belt, and that scientists are victims of an observation bias. In other words, more reliable data is needed to show that something squirrelly is going on out there. As astronomers continue the search for Planet Nine, they should also be on the lookout for signs of an unexpected band of debris along the outer reaches of our Solar System. In science, there’s no fault in pursuing multiple paths of inquiry.